Today is our second year anniversary of Hannah’s Adoption Day. 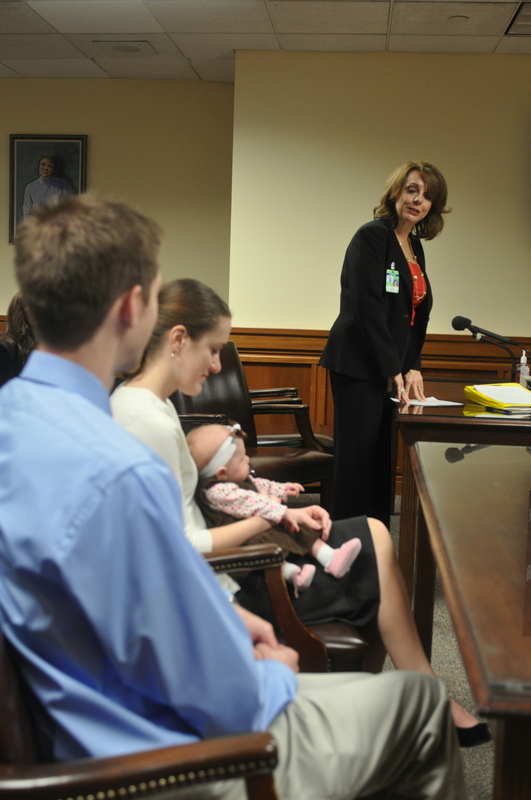 The legal side of the adoption process is different than most people think. When you bring your daughter home from the hospital, even if both biological parents have signed the proper paperwork, that baby is not yet legally “yours.” In the state of Texas, you are legally that baby’s legal guardians for the first six months, then after a social worker visit and a court date, you are finally official parents. In our case (back in 2009), our lawyer was somehow able to speed up the process and got us a court date after three months instead of six! Maybe the judge owed her a favor, I don’t know. To us, it wasn’t a big deal since mentally and emotionally we were already Hannah’s parents, no question. But we were excited to make it official. We were so blessed that our closest friends were able to come share this important event with us. 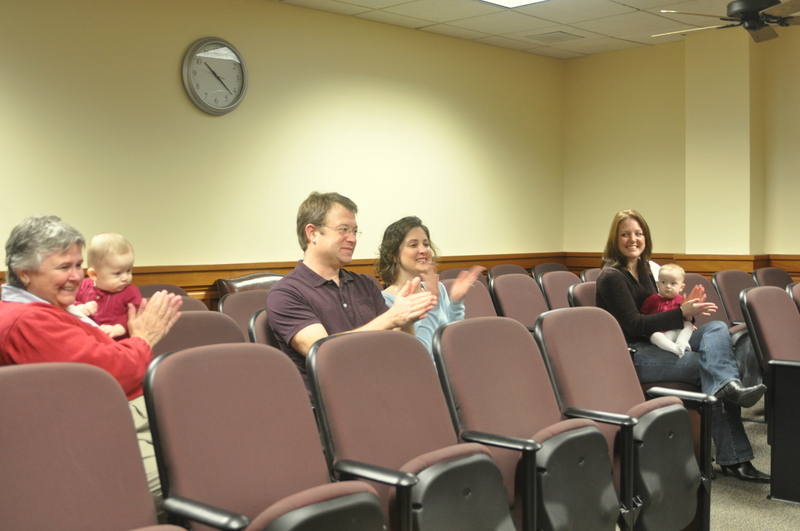 My sweet friend, Kay (of Kay Harmon Photography), documented the courtroom excitement, and here are a few of her pictures. First, our lawyer, Denise, presented our case to the judge. Then the judge said we are a family forever! And everybody clapped. Then we went outside and took a picture. 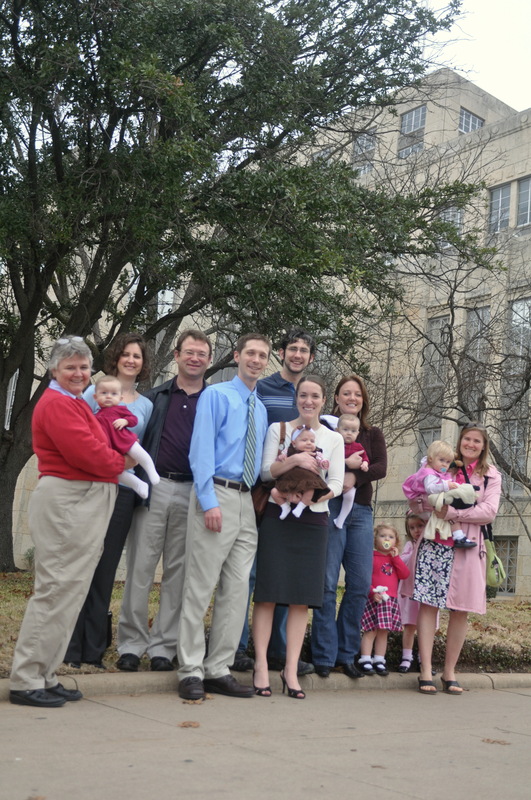 Most of our friends were from a lifegroup we were in at church several years ago. 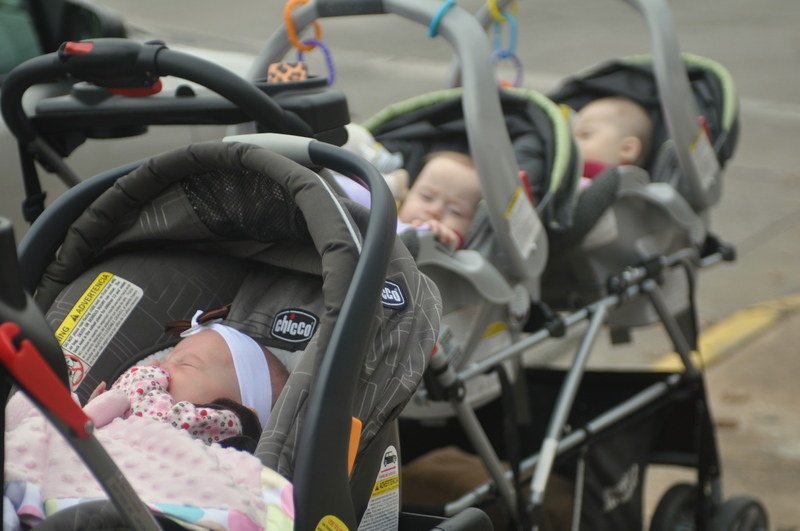 Of the people who came to our Adoption Day, three are now living in foreign countries and another family moved to Oregon. This is the last time we got to all be together. So special! As you can see, Hannah has been hanging out with Abby and Lilly from a young age. We had a party/lunch at our house afterwards. 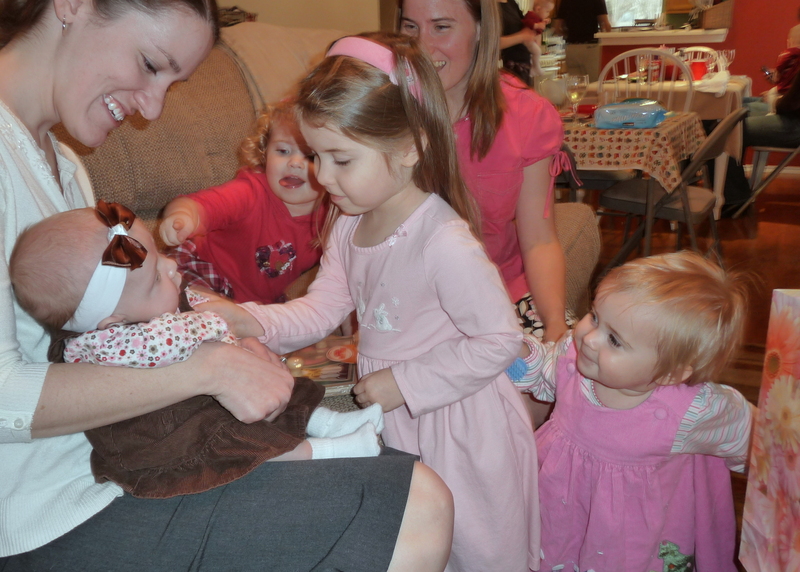 Hannah got to meet some of her third cousins. It was an amazing day we will remember forever! It’s beginning to look more like Christmas at our house. Home-decorating is not something I spend a lot of time on in general, but it’s fun to get out some special things in December. I try to keep it simple by using handmade and gifted items. Our tree is decorated with the ornaments we’ve grown up with and some inexpensive silver balls. 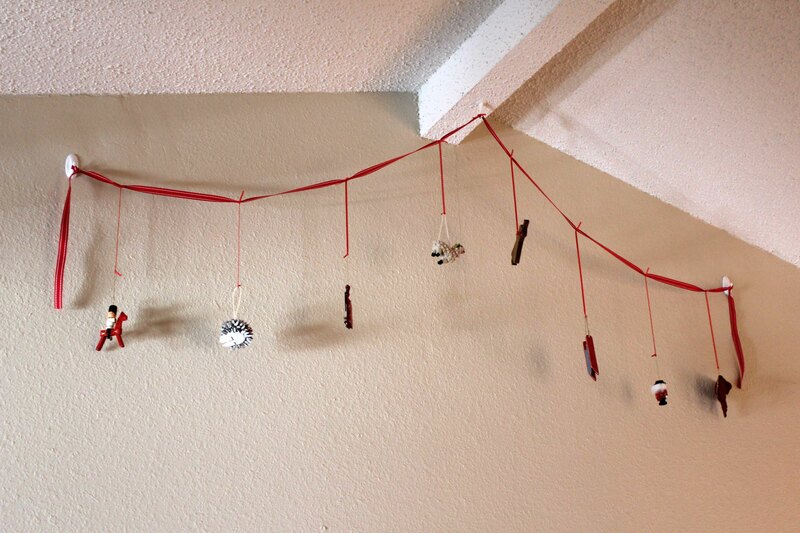 Last year, I cut some scrap fabric into strips and tied them together to create a simple garland. 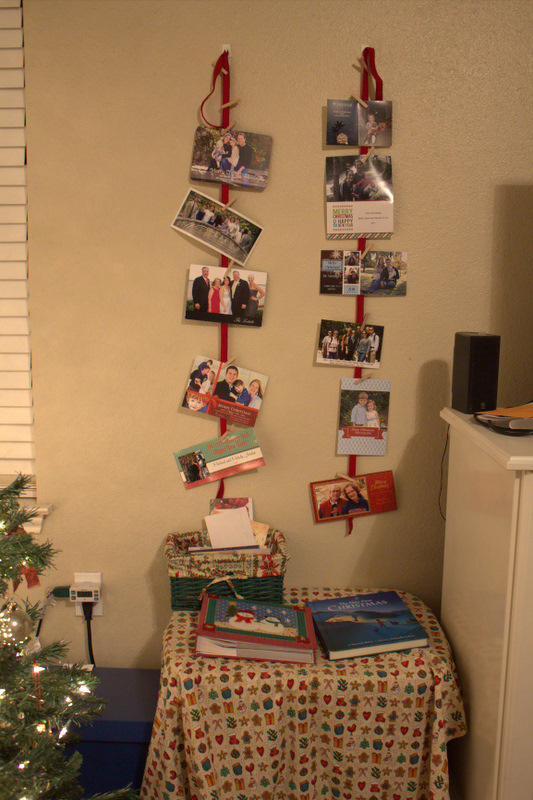 Next to the tree, I hung some ribbons on the wall with mini clothespins to display the pictures we get. I covered a storage bin with some Christmas fabric I had lying around to make a Hannah-sized table. We put the Christmas cards in a basket and laid out the Christmas books. 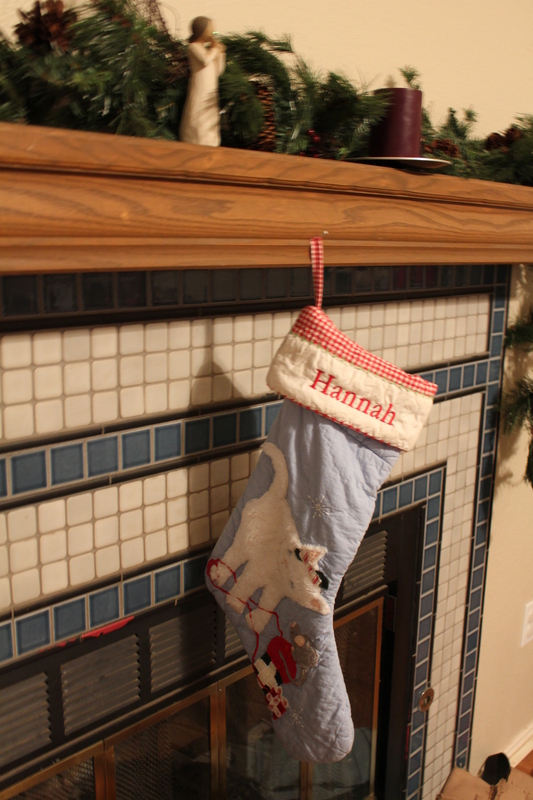 For our mantle, I splurged a bit on Hannah’s monogrammed stocking from Pottery Barn Kids. But I figured it’s something special for her to have for a long time. And yes, even though we don’t “do Santa,” we plan to fill the stocking with special snacks for her to open on Christmas morning (and be honest and tell her they’re from us). 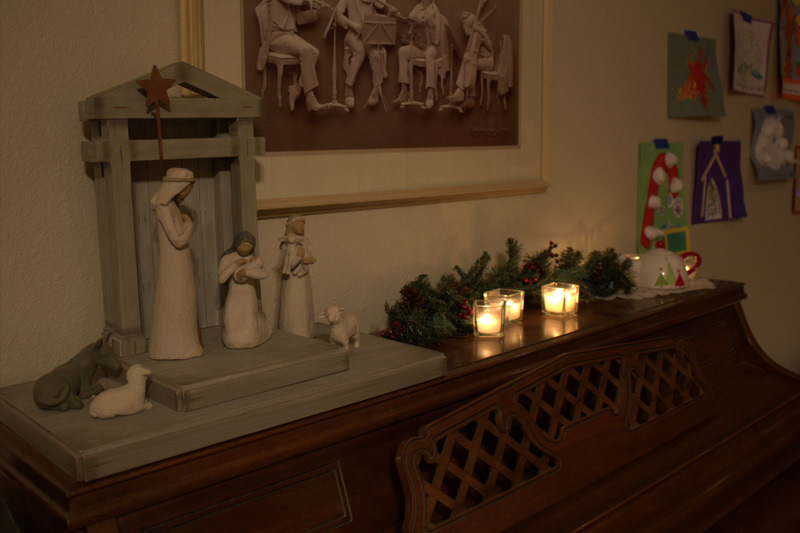 The piano displays my Willowtree nativity set – love! There is also a little fake greenery to go behind the candles. 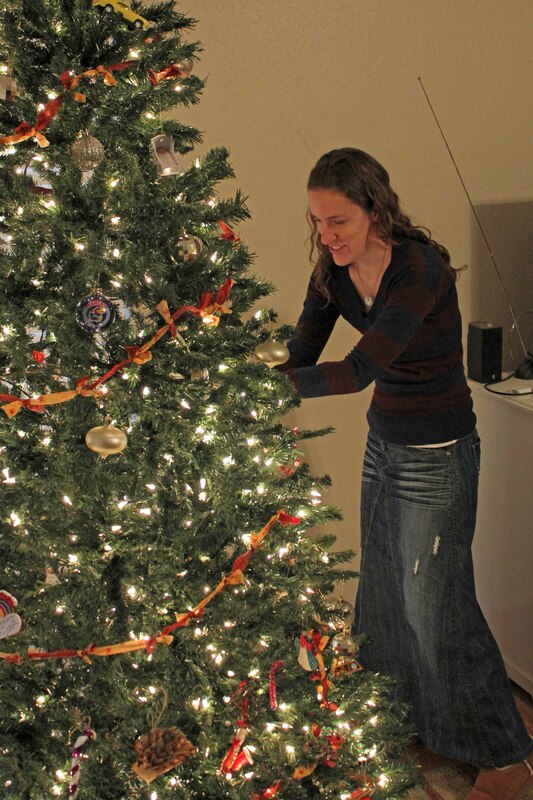 New this year, I was trying to think of a way to display ornaments besides putting them on the tree. I came up with this randomness for under $5, and it can all be reused. It seems to look better in person than in the picture. 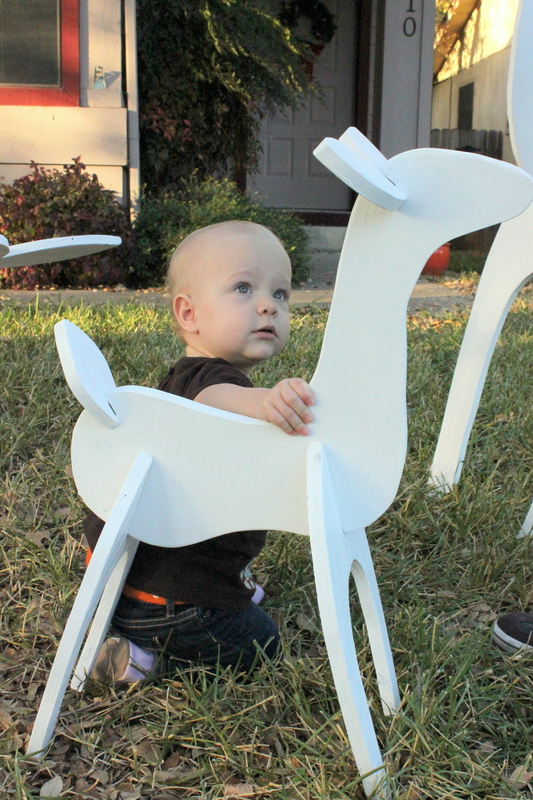 Outside we have the deer made by Brett’s dad. We have a string of white lights on the house and a lighted wreath on the front windows. This is Hannah last year with the deer. On my list for next year, I want to try a simple window decoration of ornaments hanging from ribbon that my sister-in-law did. And I just realized our pumpkins are still displayed on our porch from October, so I guess our house is caught in holiday schizophrenia. It’s finally brussels sprouts season again! I know, “brussels sprouts” looks weird, but that’s the proper spelling. I usually just say it as one word to be correct while also not sounding weird – brusselsprouts. Anyway, we are seriously excited. We just like the way they taste, and they’re a great source of Vitamin C and other good stuff. We hadn’t seen any at the farmer’s market yet, so I went ahead a picked up a big bag at Costco for a great price. I roasted half and went looking for a new recipe for the other half. The Hashed Brussels Sprouts with Lemon at Simply Recipes gave me an idea. “Hash” seems like a great way to use up all kinds of random things. I happened to have some potatoes and bacon – sounded like a good combo. 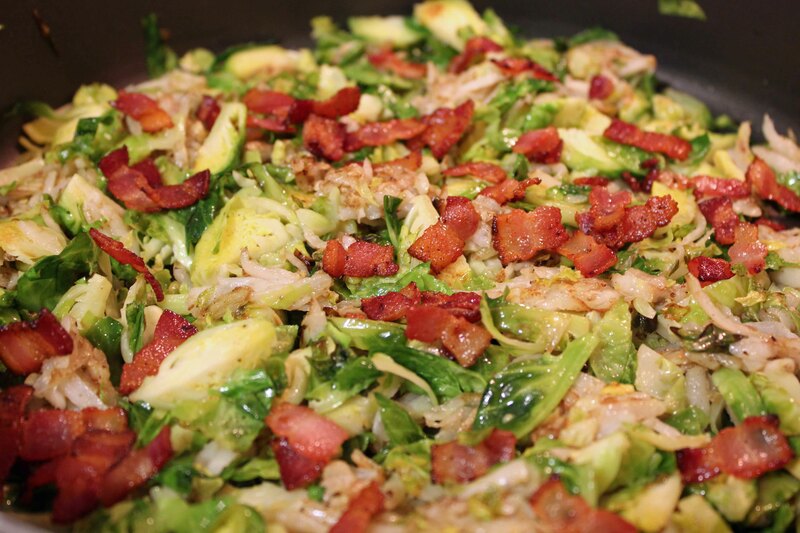 So here’s my brussels sprouts, potato and bacon hash. I started by cooking 4 sliced strips of bacon then removed them, leaving the yummy bacon drippings in the pan. Then I shredded 2 small (unpeeled) potatoes and started cooking them in the delicious bacon juice. I finely sliced 1 lb. brussels sprouts and tossed them in with the potatoes. I added a little salt and pepper and just waited for them to all be cooked through. Before serving, I sprinkled in the bacon. We ate the whole pan. No kidding. If you are convinced you don’t like brussels sprouts, try something new with them. This hash was delicious (of course, cooked in bacon! ), but I also highly recommend roasting them. There are lots of recipes online, so do a search, find one you’re comfortable with, and give it a shot! 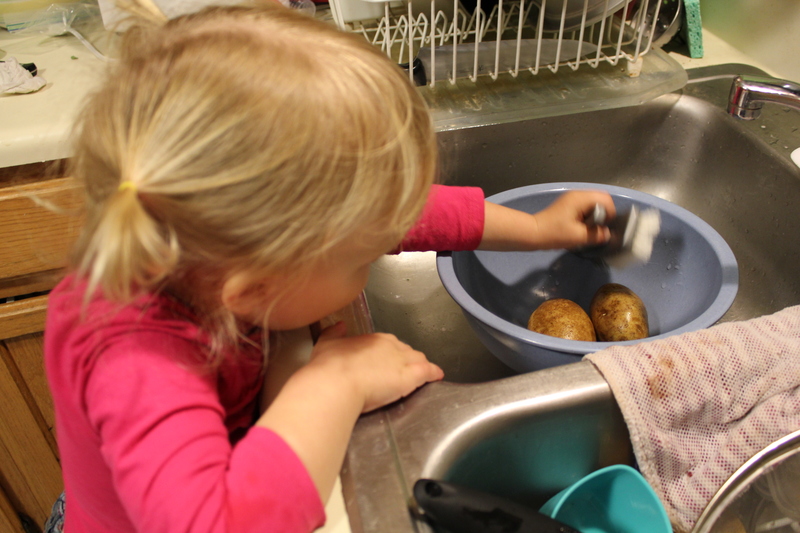 And with the winter crud starting, we could all use a little extra Vitamin C.
Here’s Hannah helping me wash the potatoes. One year ago today, Hannah had a febrile seizure. At the time, we didn’t know a lot about it, so I wanted to write a post to share our experience. Hannah had been acting completely normal all day. She seemed to be teething a bit and was slightly warm, so I gave her a dose of ibuprofen before bed. A couple hours later, we heard her make a strange noise, sort of a groan. Brett went to check on her and immediately called for me. As soon as I saw her, i could tell she was having a seizure. Her body was rigid and shaking, and her eyes were glazed-over. This was the scariest moment of my entire life. I had a flashback – when I was a preschool teacher, I had to take CPR classes which included seizure training (more on this later). I put her on the floor while Brett called 911. An ambulance and a firetruck were in front of our house in about four minutes! The seizure had stopped well before then, so in that time I packed the diaper bag with anything I thought we’d possibly need for several hours in the emergency room. The paramedics came in and put a tiny oxygen mask on her and told us that febrile seizures are caused by a fever spike. There are no lasting effects, and they are unlikely to happen again. But they told us we did the right thing by calling 911 since it was her first seizure and needed to be accurately diagnosed. Hannah was strapped on the giant stretcher, clutching Bo (her blankie), and we got to go on our first (and hopefully last) ambulance ride. By the time we got to our room in the Dell Children’s Hospital ER, Hannah was back to her normal self (plus tired and bored). The doctor checked her out and ran some tests in an attempt to identify an infection that may have caused the fever. All the tests came back normal, so we think it must have been caused by the teething. We got to leave at 12:30, as in midnight, after 2 1/2 hours which I hear is pretty good for the ER. Hannah was exhausted and slept for most of the next 36 hours. 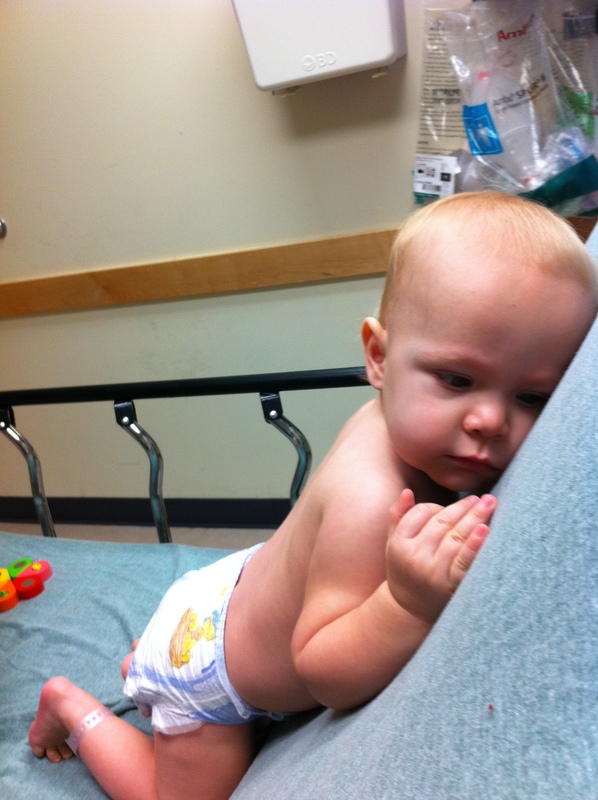 There is a possibility she could have another febrile seizure, but the likelihood decreases as she gets older. We are very careful about her being outside when it’s hot, and we don’t mess around with fevers. If we are going to be away from her for a length of time, we like to be sure that whoever is with her is knowledgeable about seizure response. With Hannah a year older, Christmas is very different from last year. She’s walking and running and talking and into everything. 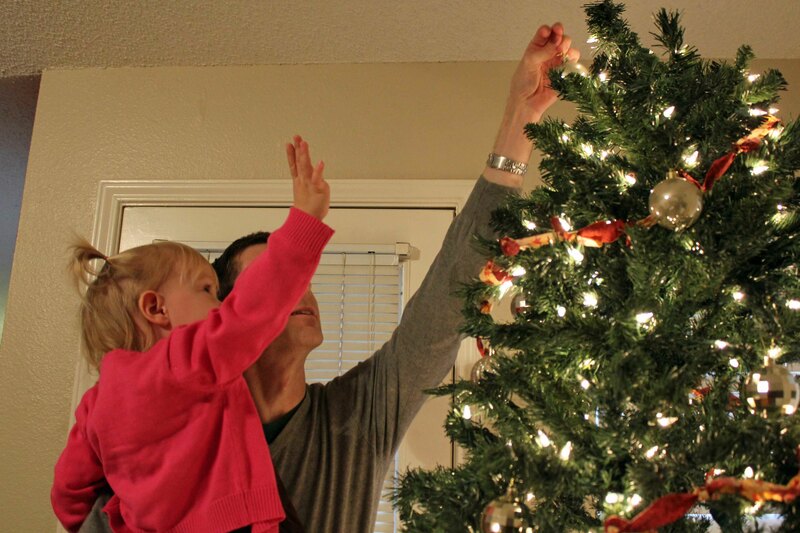 So we made tree-decorating a family project. 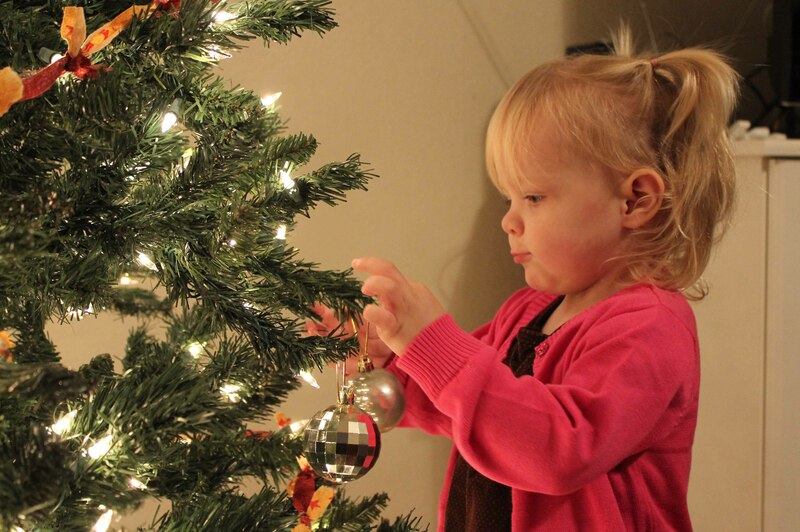 Hannah liked to put all the ornaments in a toddler-level row. Then she told Brett where to put them up high. Later, while she was napping, I evened them out a bit. This is not your grandmother’s pot roast. Unless your grandmother was Cuban. 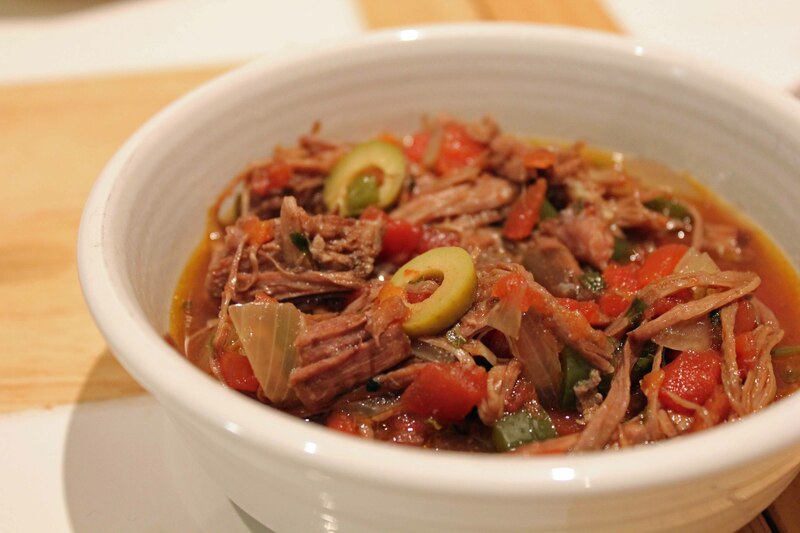 “Ropa vieja” basically translates as “old clothes,” implying this is what you could do with some leftovers. 1. In a large skillet, brown beef in oil on all sides. Transfer meat to a 5-qt slow cooker. Add onions and peppers. Combine tomatoes, water, garlic, cilantro, beef bouillon, pepper, cumin and oregano; pour over vegetables. 2. Cover and cook on low for 6-8 hours or until meat is tender. Remove beef; cool slightly. Skim fat from cooking juices; stir in olives. Shred beef with two forks and return to slow cooker; heat through. Serve with rice if desired. 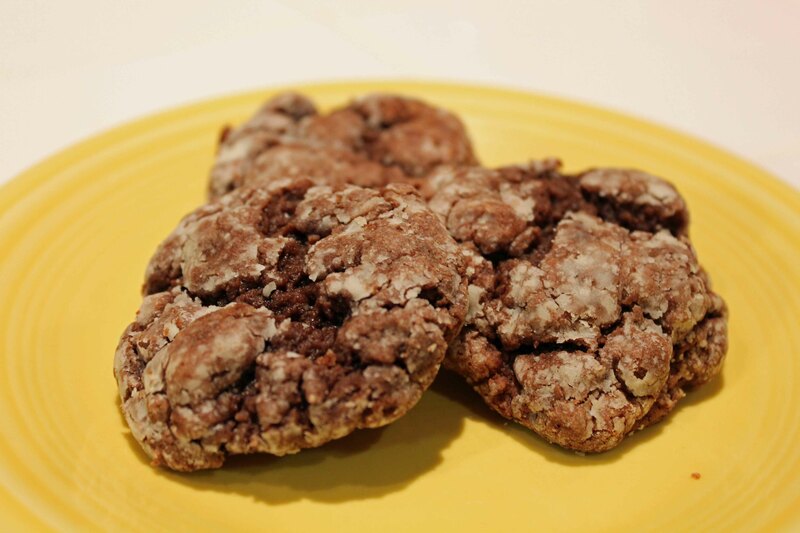 This recipe is from the Taste of Home magazine. I made a couple changes – first, I didn’t cut the roast in half and brown it in oil, I just put it straight in the slow cooker. I also didn’t use green peppers, and I skipped the habanero in favor of some extra jalapeños. I probably should have done the habanero because it didn’t turn out spicy at all and could have used a little extra heat. I also didn’t use the bouillon because I didn’t have any, and I think it was fine. Everyone liked it, including Hannah. Instead of serving hers on rice, I put it in a tortilla and told her it was a taco. She’ll pretty much eat anything if you tell her it’s a taco.